Amazingly, a relic from the era of High School Musical is still shining brightly in 2015. Zac Efron has put the Disney teeny-bopper days behind him once and for all, going from raunchy comedies to mellow romance dramas, all of which require at some point his shirt to be removed (what on earth would Mickey say?). Make of him what you will, but there’s no denying that he is now a definitive grown-up movie star. It’s somewhat jarring, then, to see the now 27-year-old retreat back into the “coming-of-age” role he would have done ten or so years ago, in his latest entry for stardom We Are Your Friends. 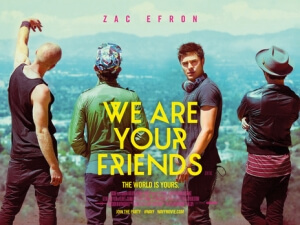 Playing a struggling DJ in the Hollywood area, Efron finds work alongside his equally-attractive buddies (Shiloh Fernandez as an aspiring actor, Jonny Weston as a muscle-bound roofer, and Alex Shaffer as, erm, the other one) promoting their work in various nightclubs to college students and anyone else who’s interested. Efron’s Cole catches the eye of more successful DJ James (Wes Bentley), who soon becomes his mentor and helps him find his unique sound, and eventually earns the attention of James’ assistant/girlfriend Sophie (Emily Ratajkowski)… and it’s very likely you can guess where things are headed from there. The fact that a lot of the film borrows heavily from similar films – it’s basically A Star Is Born with more beat drops – means that much of what you see here is neither new nor reworked enough to pass as a new spin. After a while, you just don’t care about anything or anyone; none of it begs to be of interest to the common filmgoer, especially to those who are so familiar with this basic story to begin with. You’re not invested in Efron because, despite a decent acting turn, he’s stuck with a bland character with bland goals in mind; you’re not intrigued by what’s going on with Bentley or Ratajkowski, because their personalities here are on par with The Californians from Saturday Night Live (Ratajokwski, in particular, is subject to lingering camera shots that display her as nothing more than big-lipped eye candy); and you especially don’t give a toss about the titular friends, who are mostly beefed-up jerks and are so unlikable – Weston especially – you start to wonder why Efron is friends with them in the first place. The emptiness of the characters is so obvious – but then again, this is set in Los Angeles – that the emotional attachment is all but extinct here. The same can be said for its overall plot, which meanders from scene to scene so light-headedly you’d almost be mistaken for thinking this was just an extended music video, written and executed around the material it is meant to be representing. You may think that’s just an analogy, but when you see scenes such as a PCP-enhanced animated sequence take hold of the screen, you’ll be looking around the screen to see where Arcade Fire or the like are playing their song on the soundtrack. Sometimes, the plot can switch on a dime and change the tone dramatically – a sub-plot which sees Efron and co take up jobs working for a crooked real estate agent (Jon Bernthal) feels like it fell out of a completely different movie, and very rarely comes back into play within the context of the actual story. However, where the movie truly breaks out is with exactly what you think, in a story about DJs no less – the soundtrack is extremely lively, and mixed to an effective rhythm that can harness the power to get people in the auditorium up and dancing. There are various info-graphs displayed throughout the film that show the power of dance music on the party-goers, some of which go into detail about how certain beats match up to the dancer’s heart rate and cause the adrenalin to rush through their systems – given how energetic some of the mixings can be, it’s hard not to buy into what is likely nonsense designed to make the film seem cleverer than it seems, but then again we know nothing about making music on this scale. Most impressive, however, is a climactic display of sounds and beats that build up to an emotional payoff for the main character, and it’s a good enough track to get the audience on their feet and dancing for the rest of the flick. Like most music videos, the music is great but when We Are Your Friends tries to be anything else instead of what it originally should be, it’s something that’s not worth caring about. We Are Your Friends is more or less an extended music video, with an outstanding club anthem soundtrack but very little in terms of concrete plot or characters worth caring about. Just buy the album, instead.